Many case reports of acute pancreatitis have been reported but, up to now, pancreatic abnormalities during acute gastroenteritis have not been studied prospectively. To evaluate the incidence and the clinical significance of hyperamylasemia in 507 consecutive adult patients with acute gastroenteritis. The clinical significance of hyperamylasemia, related predisposing factors and severity of gastroenteritis were assessed. Hyperamylasemia was detected in 10.2 % of patients studied. Although amylasemia was found over four times the normal values in three cases, the clinical features of acute pancreatitis were recorded in only one case (0.1%). Hyperamylasemia was more likely (17%) where a microorganism could be identified in the stools (p < 0.01). Among patients with positive stool samples, Salmonella spp. and in particular S. enteritidis, was the microorganism most frequently associated with hyperamylasemia [17/84 (20.2 %) and 10/45 (22.2%), respectively], followed by Rotavirus, Clostridium difficile and Campylobacter spp. Patients with hyperamylasemia had more severe gastroenteritis with an increased incidence of fever (80 % vs 50.6 %, O.R. 3.0; P < 0.01), dehydration (18% vs 8.5%; O.R. 2.5; P < 0.05), and a higher mean number of evacuations per day (9.2 vs 7.5; P < 0.05) than those with amylasemia in the normal range. Hyperamylasemia was significantly associated with cholelithiasis, (30.0 % vs 10.7%, O.R. 3.5; P < 0.01) and chronic gastritis or duodenal ulceration (22.0 % vs 10.2%, O.R. 2.4, P < 0.05). Hyperamylasemia is relatively frequent, and is associated with severe gastroenteritis. However, acute pancreatitis in the setting of acute gastroenteritis, is a rare event. A wide variety of infectious agents have been associated with acute pancreatitis. Pathologic and radiological evidence of pancreatitis in the course of well documented infection has been associated with viruses, bacteria, fungi and parasites . In particular, a high incidence of acute pancreatitis in adult patients with Salmonella infection has been reported by Renner F. et al. . In this study, although pancreatic enlargement was demonstrated by abdominal sonography in about half of patients, the course of pancreatitis was mild or moderate with complete recovery. However, many case reports of clinical severe acute pancreatitis during salmonellosis have been reported, suggesting that serious pancreatic disease may represent a complication of Salmonella infection [3–10]. Similarly, acute pancreatitis has sporadically been reported during Campylobacter enteritis as well as Rotavirus infection [11–14]. Up to now, pancreatic abnormalities during acute gastroenteritis have not been studied prospectively. To evaluate the incidence, the clinical features and the relationship with predisposing factors of hyperamylasemia we prospectively studied a large number of patients consecutively hospitalised with a diagnosis of acute gastroenteritis. From January 1996 to December 2000, 507 consecutive adult patients (males = 224, females = 283, mean age 41.6 (19.5, range 18–92) with acute gastroenteritis and admitted to the Infectious Diseases Department of S. Bortolo Hospital, Vicenza (North East Italy) were enrolled in this study. None of the cases studied had a previous history of pancreatic disease and none declared an alcohol intake more than 40 grams per day. At admission, severity of the disease was scored according to the criteria reported by Goodman et al . Briefly, gastroenteritis was defined as grade 1 in patients with 4 or less evacuations per day, without any systemic signs or symptoms; grade 2, with more than 4 evacuations per day with or without systemic signs or symptoms and grade 3, more than 6 evacuations per day associated with one or more of the following signs and symptoms: fever (>38°C), nausea, vomiting, malaise, dehydration, tenesmus, abdominal pain and blood and/or leukocytes in the stools. Dehydration was evaluated at the time of hospitalisation (skin turgor and tongue hydration) and classified as present or absent. Age, gender, medical history, current diseases and duration of hospitalisation were recorded. Faecal specimens (collected after natural evacuation at admission, after 24 and 36 hours) were cultured and analysed by direct examination for the presence of blood, leukocytes and parasites (May Grunwald Giemsa). Cryptosporidium oocysts were sought by acid-fast Ziehl-Neelsen method. All samples were also tested for Rotavirus by using latex agglutination assays (Orion Diagnostica, Espoo, Finland). All patients underwent routine blood and biochemistry tests (leucocytes and red cells count, transaminases, Y-glutamil transpeptidase, alkaline phosphatase, bilirubin, electrolytes, creatinine, erythrosedimentation rate, cholesterol and tryglicerides). Blood cultures were performed in patients with temperature above 38°C. Amylasemia was tested at admission, and at least twice during hospitalisation, by a specific colorimetric test for the pancreatic subunit according to the manufacturer's instruction (iso-amylase pancreatic, ALIFAX S.p.A Padua, Italy). This method uses a monoclonal antibody that specifically pre-inhibits human salivary alpha-amylase (EC 3.2.1.1), and cross reacts negligibly with the pancreatic isoenzyme . Amylasemia was recorded in 64 cases of non-infectious diarrhea (mushroom poisoning, hospitalised from 1996 to 2000) and in 50 patients with various infectious diseases (36 bacterial pneumonia, 5 patients urinary tract infection and sepsis, 4 bacterial meningitis, 5 Staphylococcus aureus infection) as negative control groups. All patients with hyperamylasemia were examined by ultrasonography. Acute pacreatitis was defined accordingly to the Atlanta classification . Student's t test was used to compare mean values. Chi-square, Chi-square for linear trend and Fisher's exact tests were used for comparing proportions. The Odds ratio and Confidential Intervals (C.I.) at 95% were calculated by Fleiss quadratic method; for all results, upper and lower C.I. limits for 95% are given. All P values are two-tailed; a P values < 0.05 was considered statistical significance. At admission, hyperamylasemia (mean levels 195 UI/ L, range 130–1560 UI, normal values <115 UI/L) was found in 10.2% (50/507), 1.5% (1/64), and 0 % (0/50) of patients with acute gastroenteritis, non infectious diarrhea (mushroom poisoning), and various infectious diseases, respectively (P < 0.01). In three cases amylasememia was found over four times the normal range (460 UI/L, 520 UI/L and 1560 UI/L, respectively) but only one case (amylase 1560 UI/L) had the clinical features of acute pancreatitis (typical pain with radiation, and poor response to normal analgesics and antispastic drugs). None of the patients with a normal amylasemia at admission developed hyperamylasemia during hospitalisation. Patients with and without hyperamylasemia were comparable in terms of gender, mean age, frequency of antibiotic therapy, duration of evacuations before admission and frequency of abdominal pain (Table I). The characteristics of abdominal pain (escluding the case with overt pancreatitis) were similar in both groups. The pain, strictly correlated with the course of gastroenteritis, was mainly localised in the central abdomen, without radiation and with a good responsiveness to antispatic drugs. * P < 0.05; ** P < 0.01;a, O.R. = Odds ratio; b C.I = Confidence interval 95%, ° Chi-square for linear trend 4.3, P < 0.05. Moreover, cholesterol, thriglicerides alkaline phosfatase, Y-glutamil-transpeptidase, transaminases, bilirubin serum levels did not differ significantly between patients with and without hyperamylasemia. Furthermore, hyperamylasemia was unrelated to impaired renal function [mean creatinine serum levels was 0.8 ± 0.3 mgr/dl – normal values < 1.2 mgr/dl – in patients with hyperamylasemia and 0.9 ± 0.4 mgr/dl in patients with amylasemia in the normal range]. Instead, an elevated erythrocyte sedimentation rate was found associated with hyperamylasemia (mean values 31.3 versus 21.3; P < 0.05). Univariate analyses demonstrated that hyperamylasemia was significantly associated with cholelithiasis or previous cholecystectomy, as well as gastric or duodenal diseases (chronic gastritis or duodenal ulcer) (Table I). In the acute gastroenteritis group, hyperamylasemia was recorded in 28 (17%) of the 164 cases with an identified microorganism in stool samples and in 22 (6.4%) of the 343 cases without a microbiological diagnosis (P < 0.01). Hyperamylasemia was significantly associated with the severity of gastroenteritis, and the severity of gastroenteritis was significantly associated with the detectability of microorganisms in stool samples [severity score, grade 2 or 3 in 156 (98%) of patients with positive stool samples versus 176 (51.4%) in patients with negative stool samples, P < 0.01, Table I] . Among patients with positive stool samples, Salmonella spp. and in particular S. enteritidis, was the microorganism most frequently associated with hyperamylasemia [17/84 (20.2 %) and 10/45 (22.2%), respectively], followed by Rotavirus, Clostridium difficile and Campylobacter spp. (Fig. 1). In 5 patients Salmonella infection was accompained by sepsis (bacteremia in presence of systemic signs and symptoms of acute infection): all these cases had amylasemia in the normal range. The patient with clinical features of acute pancreatitis and the other two cases with amylasemia over four times the normal range had cholelithiasis and Salmonella-related acute gastroenteritis. 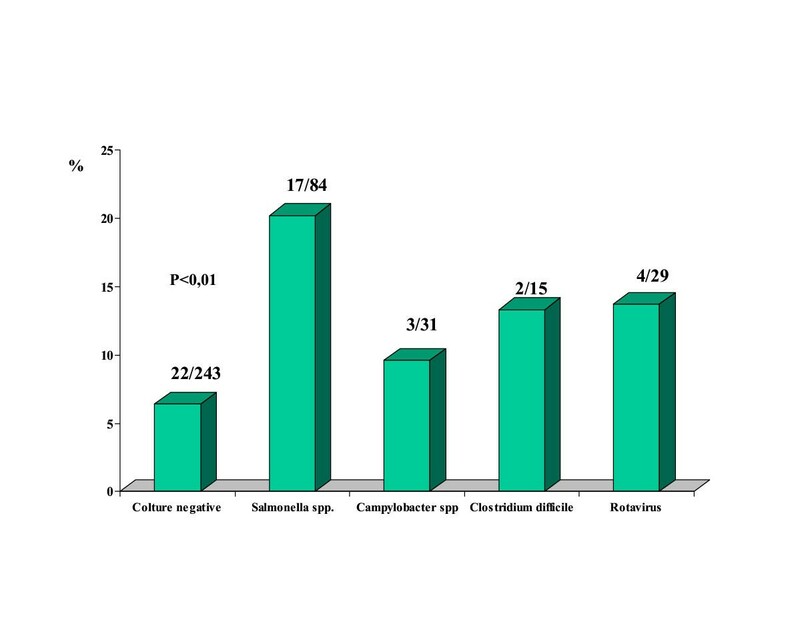 Percentage of patients with hyperamylasemia according to microbiological diagnosis Among other microrganisms not reported in the percentage, hyperamylasemia was recorded in 2 cases: 1 case positive for Strongiloides stercoralis and 1 positive for Giardia lamblia. All patients recovered without any complications, including the the case with acute pancreatitis. However, in 5 of 50 (10.0%), abnormal levels of amylasemia persisted for more than 3 weeks. Ultrasound examination (performed in all cases with hyperamylasemia) revealed pancreas enlargement in 2 cases (increased volume of the head of the organ), not evaluable in 5 cases, and normal in 43 cases. Dilatation of the bile ducts was observed in none of the cases examined. In the patient with clinical and laboratoristic features of acute pancreatitis, the diagnosis was confirmed with by CT scan performed with contrast enhancement which allowed to identify an oedematous form. In this study we prospectively evaluated the incidence of hyperamylasemia, its clinical significance, and related predisposing factors among 507 consecutive patients with acute gastroenteritis. Although hyperamylasemia was recorded in 10.2% of patients with gastroenteritis, acute pancreatitis was observed in only one case (0.1%). Hyperamylasemia correlated directly with the severity of the disease, and its incidence was significantly higher in patients with than patients without a microbiological diagnosis, and was particularly associated with Salmonella infection (22%). Although this association is lower than that reported by Renner F. et al. , and by Hermans P. et al. , our data confirm, in a prospective study, that a real association between Salmonella spp. and hyperamylasemia exists. This could be explained in several different ways: Firstly, intestinal inflammation could lead to an increased permeability which allows the reabsorption of macromolecules, such as amylase. This hypothesis has been suggested by Gnadinger M.P. et al. , who demonstrated an increased intestinal permeability for oral 51Cr-EDTA in two patients with elevated amylase serum levels in the course of entero-invasive salmonellosis. Our clinical findings, as well as those reported by other authors, do not seem to confirm this hyphothesis, since pancreatic enlargement and overt acute pancreatitis has been demonstrated in the setting of acute gastroenteritis [2, 7]. Secondly, hyperamylasemia could be either the result of a reduced excretion due to impaired renal function or the result of a profound metabolic perturbation, as it has been recently found in diabetic patients with ketoacidosis, whose amylasemia was significantly correlated with PH. . Since we have found no difference in term of creatinine serum levels between patients with and without hyperamylasemia, we can exclude the hypothesis of a reduced excretion. Furthermore, considering that vomiting is one of the main symptoms of gastroenteritis, the PH trend tends to increase instead of decreasing. Thirdly, hyperamylasemia could represent the effect of the direct pancreatic localisation of bacteria. Theoretically, this could happen by a haematogenous route, lymphatic route, transmural migration, via the biliary duct system and from the duodenum via the main pancreatic duct. Involvement of the pancreas by bacteria through a haematogenous route during acute gastroenteritis has been suggested by Schimd et al. . This hypothesis is in contrast with our findings, since in five patients where Salmonella spp. could be isolated from blood cultures, hyperamylasemia was not detected. However, bacteria may directly infect the pancreas via the biliary duct system or the duodenum. This mechanism is supported by well documented experimental data . In animal models, perfusion of bile-pancreatic duct with human infected bile induced irreversible duct damage and complete loss of duct integrity, and resulted in acute pancreatitis even at low perfusion pressures. The severity of acute pancreatitis depended on the bacterial species [22, 23]. Furthermore, cholelithiasis represents "per se" one of the main risk factor of acute pancreatitis. Our data, demonstrating a significant association between hyperamylasemia and cholelithiasis, are in agreement with both theories. We can speculate that bacteria may facilitate the precipitation of biliary sludge (microlithiasis) inducing either an elevated ductal pressure leading to intracellular enzyme activation or facilitating direct injury of the pancreas by bacteria . Alternatively, hyperamylasemia could simply represent an epiphenomena of a "biliary colic" in patients with gallbladder and dehydration secondary to water loss induced by acute gastroenteritis. The association between chronic gastritis and or duodenal ulcer and hyperamylasemia could be explained by an increase risk of severe gastroenteritis in the presence of an increased intraluminal PH, related to the therapy with anti-secretory drugs. Treatment with anti-secretory drugs, by reducing the gastric killing of ingested organisms, has been shown to represent a risk factor for salmonella infection and its severity . Despite the relative high rate of hypermaylasemia during acute gastroenteritis, pancreatitis is a rare event. It is reasonable to think that acute pancreatitis is the result of an imbalance among predisposing factors, direct injury, and protective mechanisms. Probably, in the setting of acute gastroenteritis, the onset of overt pancreatitis is influenced by host factors (genetic predisposition, and/or inflammatory response) as well as other possible still unidentified factors. Further studied are need to clarify this point. Our study demonstrates that hyperamylasemia during gastroenteritis is quite frequent, and mainly associated with severe Salmonella infection, but overt panreatitis is a rare event.